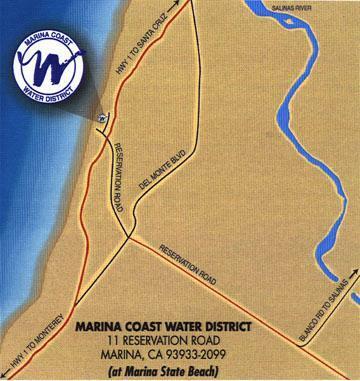 >Water quality is diligently monitored by the Marina Coast Water District. Before the water reaches your tap, water samples from source wells, chlorination treatment sites, storage tanks, distribution system and point-of-use locations have been collected and tested in state certified laboratories. Our regular program of water analysis and prudent system operation and maintenance ensures that you receive drinking water of the highest quality possible. Your water meets and surpasses both state and federal standards. Regulations require that we monitor for coliform bacteria in the distribution system every week. The presence of coliform bacteria may indicate the presence of disease-causing organisms. Samples from State approved distribution system locations, five from Central Marina and five from the Ord Community are collected and analyzed each week. A different set of five is analyzed each week in a month for each service area. There are a total of twenty different sample sites in Central Marina and twenty different sample sites in the Ord community from which water samples are collected. To make sure that water quality is maintained from the source to your tap, the District laboratory also performs weekly monitoring of general physical and chemical parameters from the same Central Marina and Ord coliform sampling sites, from District source wells and storage reservoirs. The water samples are tested for color, odor, turbidity, temperature, pH, conductivity, free chlorine residual and sulfides. In addition, the District source wells and storage reservoirs are also tested for chloride, fluoride, nitrate, bromide and sulfate. The purpose of this monitoring is to detect any abnormal concentrations that might indicate problems within the system. The District and our state certified contract laboratory monitor compliance for over 200 constituents in drinking water. Many of these constituents are naturally occurring substances. The District's water supply is tested for general minerals such as calcium, magnesium, hardness; inorganic chemicals such as arsenic, chromium and other metals; organic chemicals such as solvents, pesticides and herbicides; radioactivity including radon; asbestos and other chemicals that are still not regulated and have no state or federal standards. The District's distribution system is tested for disinfection by- products such as total trihalomethanes and haloacetic acids. Lead and copper are tested from indoor water samples to check if materials used in your home or building plumbing contribute to levels of lead and copper. It is also important that we provide you with accurate and easy to understand water quality information. So please review the monthly summaries below. PDFs will open in a new window or tab. Our water system has sampled for a series of unregulated contaminants. Unregulated contaminants are those that don't yet have a drinking water standard set by EPA. The purpose of monitoring for these contaminants is to help EPA decide whether the contaminants should have a standard. Non-detects in the UCMR3 study include Cobalt, 1,4-Dioxane, Perfluorooctanesulfonic acid (PFOS), Perfluorooctanoic acid (PFOA), Perfluorononanoic acid (PFNA), Perfluorohexanesulfonic acid (PFHxS), Perfluoroheptanoic acid (PFHpA), Perfluorobutanesulfonic acid (PFBS), 1,1-Dichloroethane, 1,2,3-Trichloropropane, 1,3-Butadiene, Bromochloromethane (Methyl Bromide), Chlorodifluoromethane, and Chloromethane (Methyl Chloride). As our customers, you have a right to know that these data are available. If you are interested in examining the results, please contact Thomas Barkhurst at (831) 384-6131 or tbarkhurst@mcwd.org.